Now that the First Quarter of 2013 is finished, here’s a look back at Q1 and comparing it to last quarter and a year ago. This is only for College Greens and Glenbrook single family homes. As you can see the low supply and high demand has been driving the prices up in our neighborhood while each home is spending less time on the market. 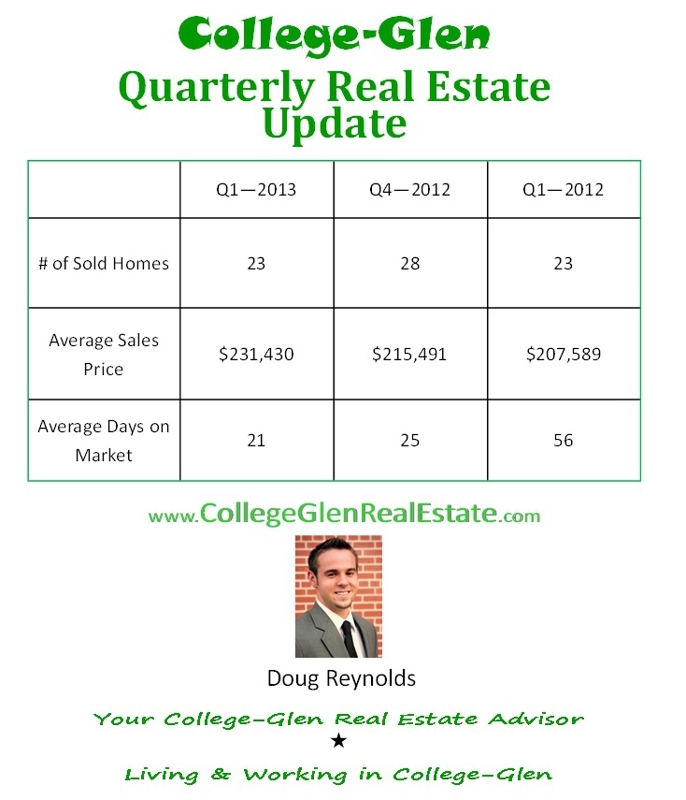 I expect Q2 prices to continue with this trend as we are heading into the spring and summer months. Our neighborhood has experienced a significant jump up in values over the past year and it’s currently being driven by supply and demand. Of the last 5 homes I’ve sold in the area, all of them had multiple offers. The homes that are priced right, show well and have a high quality marketing plan are receiving multiple offers, above list price within a few days. Usually 4 to 8 offers on a single property. If you would simply like to know what your house is now worth in this crazy Seller’s Market, Call or email me. I can easily provide you with a FREE market analysis of your home so you can know its current value. You might be surprised what your house could sell for while this seller’s market is going on.